Coca Cola outdoor branding can be really effective and durable. 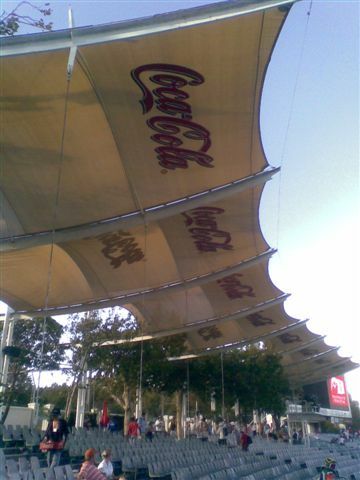 Printed Shadenet Solutions who specialise in printing on shadenet teamed up with Cape Shade who are market leaders in fabric structures to produce a landmark example of Coca Cola outdoor branding to maximum effect. 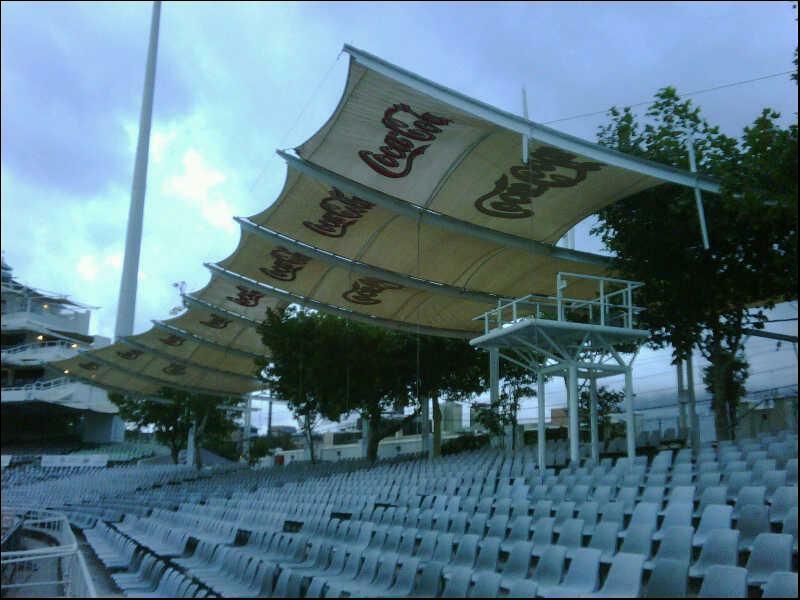 The fabric shadenet structure at Newlands Cricket Stadium was covered in large format branded shadenet which can be seen by cricket spectators and TV viewers internationally. The Coca Cola outdoor branding incorporates 5m wide logos screenprinted onto the structure which gives it exceptional durability. Durability and looking good is an essential quality of the Coca Cola brand. Digital printing does not last quite as well in the harsh Cape Town weather conditions. Coke outdoor branding is an ideal way to project the brand. 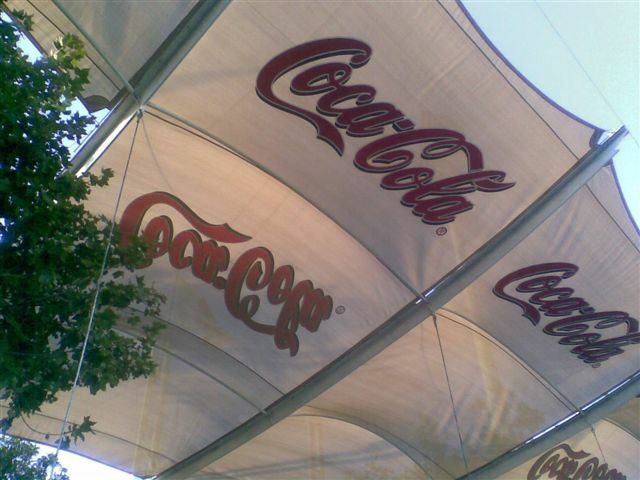 The Coke outdoor branding fabric structure was erected at Newlands Cricket Stadium just before the England vs South Africa cricket game which was a scorcher. What better way to market and position the Coke brand in 30 and 40 degree weather where consumption is reinforced with visual Coke outdoor branding and the cricket-watching consumers are there for between one and five days! The South African Coca Cola team has set a world standard with the large format 5m wide Coca Cola logos for coke outdoor branding at sports stadiums which can be followed by the rest of the world. The local Coke team is very pleased with the overall Coca Cola outdoor branding effect. 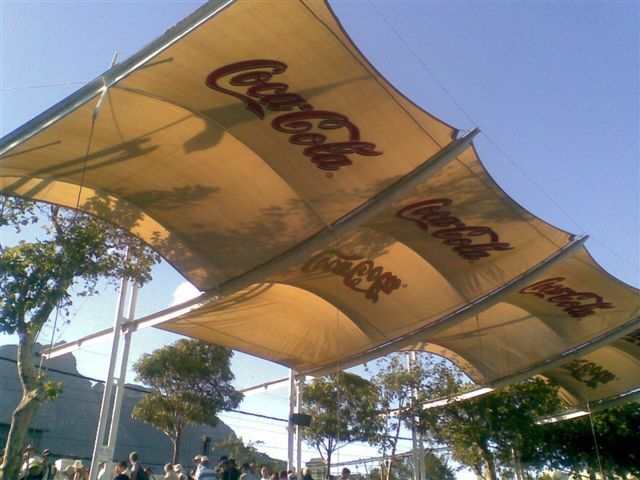 Enquire now if you are looking for Coca Cola outdoor branding or Coke outdoor branding with large scale logos on shade structures worldwide using printed shade cloth or printed shadenet.